On Sunday 9th of July 2017 I had a chance to perform at one of the biggest festivals of the world, Schleswig-Holstein Music Festival. 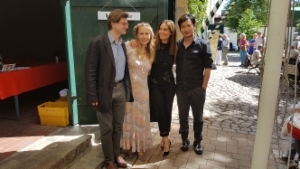 I had a great pleasure to work together with excellent musicians: the violinist Nina Karmon, the violist Wen-Xiao Zheng and the cellist Niklas Eppinger. We played Finnish romantic music. The concert was a success and it was attended by an audience of almost 2000 people. 12th of March 2016 Kloster Walderbach, Cham, Bavaria. With the violinist Nina Karmon. Geistliche Übung 265 (written in 2015) and some other LIVE recordings are now available on Soundcloud. 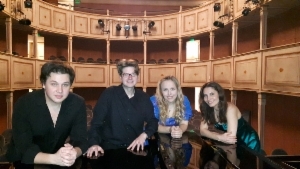 November 7 in Kaufbeuren, Germany with Dostal Pianoquartett. November 20 in Berlin, Germany, Schwartzsche Villa with the flutist Kaori Higashida. December 8 in Berlin, Germany, at the Passionskirche. December 29 in Meggen, Switzerland, at the Schloss Meggenhorn with the violinist Nina Karmon. From 2014 on, Terhi Dostal will be represented by the Concert Office of Seeli Toivio. Listen to my newest composition Ave Maria Mater Dolorosa now on Youtube! The concert performance is by Suomen Laulu Choir, Esko Kallio and Pilvi Listo-Tervaportti. I have started a blog in WordPress! You can find it here. Kulturforum Hellersdorf, Carola-Neher-Str. 1, 12619 Berlin. 7.5.2014 Concert at 7 pm Munkkivuoren kirkko / Munkkivuori Church, Raumantie 3, 350 Helsinki, Finland. 9.5.2014 Concert at 7 pm Vihdin kirkko / Vihti Church, Kirkkotie, 03400 Vihti, Finland. 10.5.2014 Concert at 4 pm Jaani Kirik / St. John's Church, Vabaduse väljak 1, 10146 Tallinn, Estonia. 5.6.2014 Concert at 6 pm St. Henrik's Cathedral, Pyhän Henrikin aukio 1, 00140 Helsinki, Finland. Four short films on Johannes Brahms by Terhi Dostal & Paula Saraste are now online! The still photos of Terhi Dostal's upcoming Brahms Documentary project are now online. Terhi Dostal gave birth to a healthy and beautiful baby boy in the 2nd of August in Berlin. The mother and her son are both doing well. She will be on maternity leave until the spring 2014. 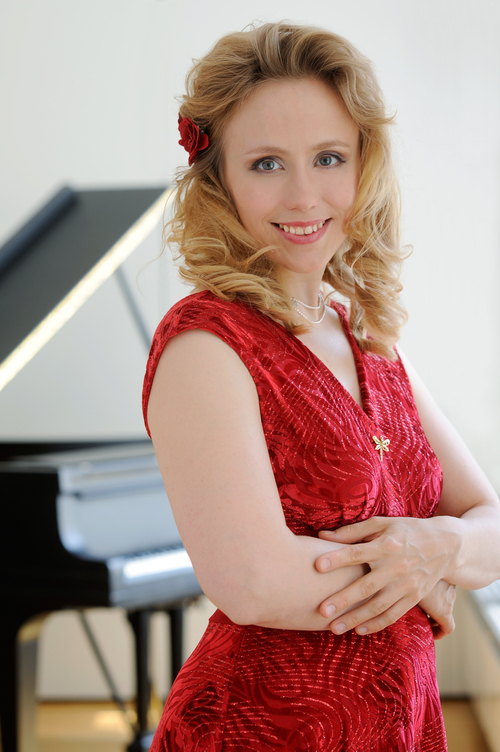 Terhi Dostal will perform at the Valery Gergiev Festival in Mikkeli, Finland, in the 30th of June 2013. She will play solo piano pieces by Johannes Brahms and Alberto Ginastera and also songs and arias by Mussorgsky, Wolf et al. with two excellent Finnish singers: Arttu Kataja (baritone) and Timo Riihonen (bass). 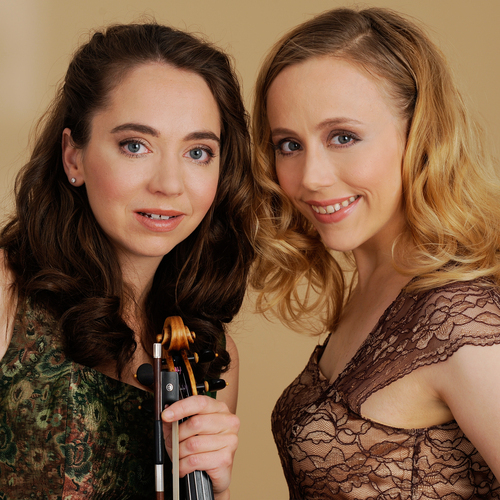 Terhi Dostal and Annemarie Åström's new CD now available! Lichtwarksaal, Neanderstraße 22, 20459 Hamburg. Free entry. In co-operation with the Johannes Brahms Society Hamburg and the Carl Toepfer Society. Konzerthaus Berlin, Gendarmenmarkt, 10117 Berlin. Tickets at the Box Office (Abendkasse) 15e/20e. Tickets im Internet 24,50e. In co-operation with the Finnland-Institut in Deutschland. Barocksaal vom Kloster Walderbach, Kirchstraße 5, 93194 Walderbach. Works of Beethoven, Brahms, Sibelius and Prokofiev. 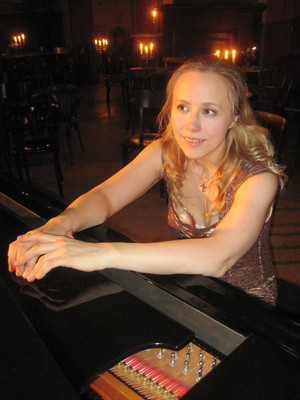 Terhi Dostal's next concert will be in the Turku Castle, Finland, in the 9th of March 2013. She will perform Janacek's Concertino and Brahms's Clarinet trio with the players of the Turku Philharmonic Orchestra. New Year's Day 1.1.2013 at 5 pm. Terhi Dostal recorded a new Brahms CD with the violinist Annemarie Åström. She made this recording with the historical grand piano of the Viennese Fellinger Family, now owned by the Austrian Brahms Museum in Mürzzuschlag. Johannes Brahms played with this instrument numerous concerts in the 1880s. The recording will be published in April 2013 by the German recording company NCA Records. 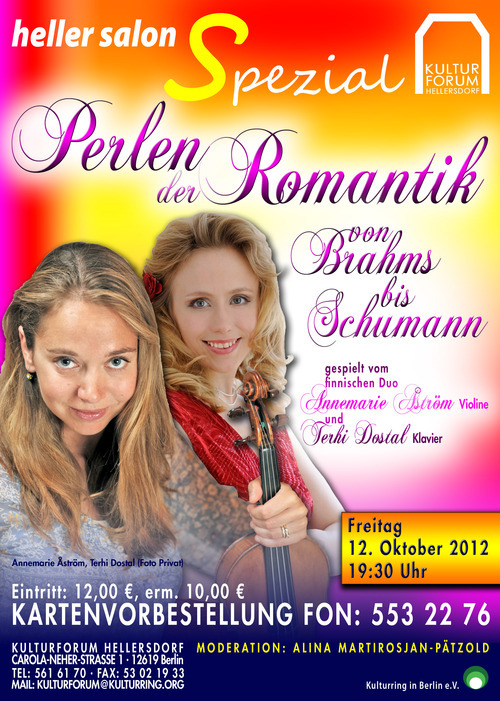 Terhi performs in the Austrian Brahms Museum with the violinist Annemarie Åström in the 28th of October, at 6 pm. 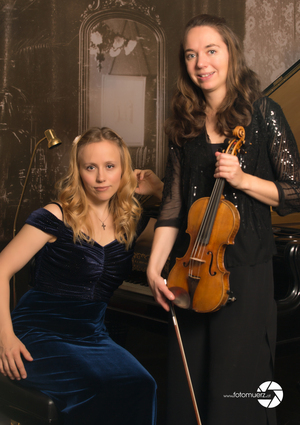 We start the new concert season with Johannes Brahms's works which you have not yet heard: Together with the Finnish-Swedish violinist Annemarie Åström, the pianist Terhi Dostal presents Brahms's both sonatas Op. 120 as the composer's own version for violin instead of clarinet or viola. 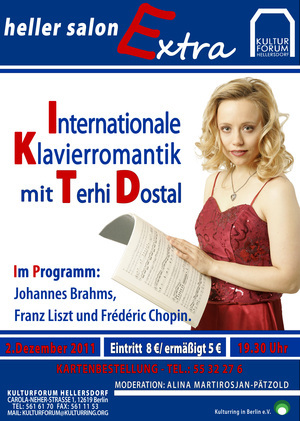 Terhi Dostal plays with the Brahms grand piano and will record this programme on a CD shortly after the concert. By the way: Brahms himself played these versions with this same Streicher grand piano 117 years ago at the house of the family Fellinger, together with Marie Soldat, who played the violin. Terhi's newest article about Brahms and Schumann available in the book Porrassalmi V (in Finnish)! Terhi Dostal: "Schumann Brahmsin esikuvana - ohjelmallisten viitteiden leikki ja tragiikka." ("Schumann as Brahms's role model - the playfulness and tragedy of the programmatic references".) 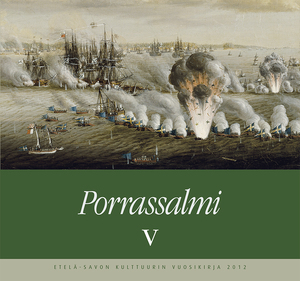 Porrassalmi V. Etelä-Savon kulttuurin vuosikirja 2012. Savon Sotilasperinneyhdistys Porrassalmi, Mikkeli 2012. Terhi Dostal signed 19 September 2012 a recording contract with the international record label NCA Records which has its central office in Hamburg: www.ncamusic.com. "The piano music of Brahms might have been my next choice even had I not just received a marvelous disc from SIBA, with Terhi Dostal playing four sets of the composer's variations. [...] Dostal paces it all well; the sound was rich, warm and powerful..." Stereophile, September 2012 (vol. 35 no 9, page 59). Brahms: Sonata Nr. 2 in F sharp minor Op. 2. Terhi Dostal, piano LIVE. Scriabin: Sonata Nr. 3 in F sharp minor op. 23. Terhi Dostal, piano. Brahms: 7 Fantasies Op. 116, played by Terhi Dostal. LIVE recording from the Helsinki recital. Beethoven: Sonata in F minor Op. 57 "Appassionata", played by Terhi Dostal. LIVE recording from the Helsinki recital. Terhi Dostal's new artist photos were taken by Thorsten Heideck in Berlin. Special thanks to the Finnish Culture Institute in Germany! 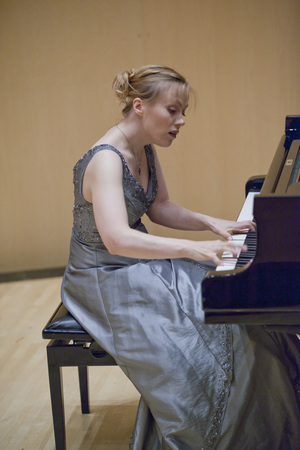 Terhi Dostal, better known for the Mikkeli people as Terhi Jääskeläinen, showed convincingly her expertise at Chopin and Brahms’s piano music at the Chamber Music Hall of Mikaeli. Johannes Brahms’s 16 Waltzes are, despite their musical challenges, more like sympathetic atmospheric pieces than truly concertizing music. Dostal formed the series of these miniatures naturally, underlining delicately the special character of every waltz. Frédéric Chopin’s Polonaise in C minor Op. 40 No. 2 has remained in vain in the shadow of the more often played polonaises of the composer. Dostal brought out its hidden defiance in her intensive interpretation. The brisk treatment of rhythm delighted in the better known A major Polonaise of the same opus and prevented the mild tautology of the piece from becoming disturbing. The final piece of the concert was Johannes Brahms’s Variations on a Theme by Paganini Op. 35 which belongs to the most massive piano works of the composer. Dostal played the piece deeply musically, without indulging in superficial showmanship. This performance, as well as the whole concert, was marked by the honest musician’s deep respect for the composer." 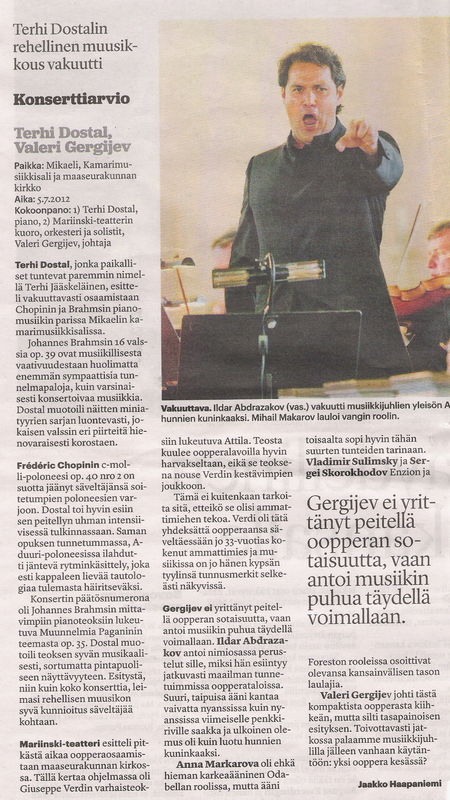 Terhi Dostal played a recital 5 July 2012 at Valery Gergiev Festival in Mikkeli. Photo by Laura Luostarinen. Terhi Dostal's Doctor's Degree was conferred in a three day Sibelius-Academy Conferment Ceremony in Helsinki, Finland, 1-3 June 2012. 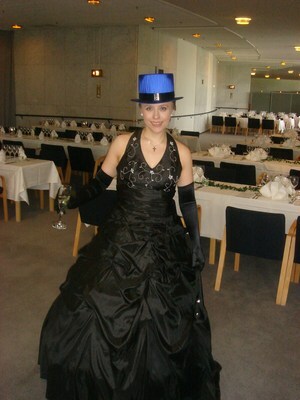 She also received the traditional Finnish academic hat. More photos in the photo album. Terhi Dostal mourns for the death of her dear piano teacher, wonderful Prof. Noel Flores from Vienna, who died 19th of May. Terhi Dostal had her first lessons with Prof. Flores at the age of fifteen and was able to receive instruction from him until her Doctor's Degree in 2010. Born in Goa, India, Noel Flores studied in Madrid and Vienna. After playing many concerts that were highly acclaimed by the press, and winning few international prizes (like the first medal at the Geneva International Piano Competition), Noel Flores was offered a chair as full Professor at the University of Music in Vienna. His class has brought out several prize-winners of International Piano Competitions, few renowned teachers & international recording & performing artists. Terhi Dostal misses deeply Prof. Flores, who was a wise, understanding and friendly man and a great musician and teacher. Terhi Dostal played a recital at the new Musik Centre ("Musiikkitalo") in Helsinki in 3rd of May 2012. Terhi Dostal played a concert in Lichtwarksaal, Hamburg, in the 16th of May 2012. 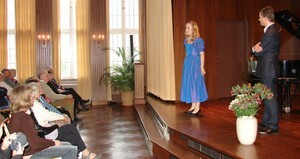 In the picture, she discusses Brahms onstage with Philipp Cavert, a radio host from NDR. More Information on the concert here. Right: Terhi Dostal after her concert in the Spiegelsall of Clärchens Ballhaus, 8th April 2012 (Photo by Paula Saraste). Ein Artikel über Terhi Dostal und andere finnische Künstler in Berlin auf Deutsch (Botschaft von Finnland, Berlin 2010). In cooperation with the Finnland-Institut in Deutschland. 2.2.2012 Pauliina Valtasaari and Terhi Dostal in the "Berlin live" of the Berliner Morgenpost and at the website of the Eunic Berlin! 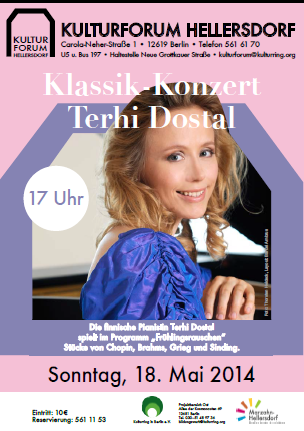 Terhi Dostal has a concert tour with a Brahms programme in May! See details. Terhi Dostal gave birth to a healthy and beautiful baby girl in the 17th of January, 2011. Terhi Dostal received her Doctor of Music degree in the 23rd of November, 2010. - order the CD by email from yksinainen@peltirumpu.fi.